You must avoid surgery date at menstrual periods. During the menstrual period, there is bleeding tendency, therefore, if you undergo surgery during the time, your hormonal imbalance aggravates bleeding and it makes us difficult to stop bleeding, which make lots of bruise and swelling and your recovery time may be remarkably delayed. You must avoid taking oral contraceptives, hormonal substances, aspirin or pain killer containing aspirin. Please, stop medication at least two weeks before embarking surgery. Drinking alcohol or smoking prevent wound from natural healing. You must stop smoking and do not drink alcohol at least 2-3 days before the surgery. If you have prior medical history of hypertension, cardiac disease, diabetes, thyroid problem, please informs us prior to the surgery. We can re-check your health status and prepare surgery. Anyone can become nervous before surgery but don’t worry about pain and have sound sleep. Use public transportation. You might have some difficulty in driving after operation. Clean your body and surgical area with shower. Wear comfortable clothes and You may eat something light meal but at least 4 hours starvation is more recommendable for safe surgery. Prepare your appointment card and charges for operation so that you won’t be late for operation time. If possible, you would better come to our clinic at least 30 minutes early. Surgical time is different from area to area. 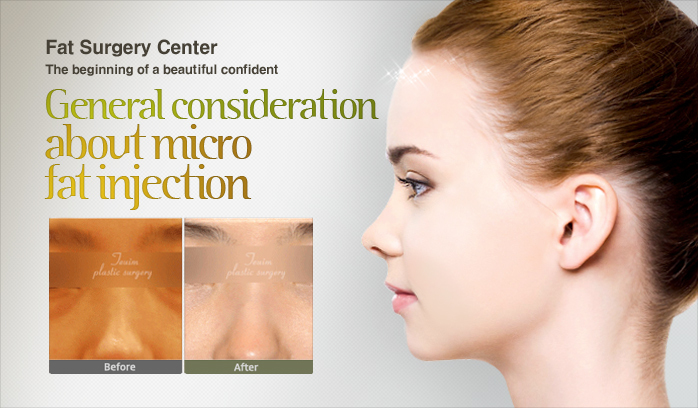 However, micro-fat injection procedure usually takes 30 minutes-2 hours. Do not smoke or drink alcohol for 3 week after surgery. Alcohol makes inflammation or infection and smoking obstructs blood circulation, which makes low survival rate of implanted fat. Although it is different from patients to patients, immediate post-operative condition is very good in respect to other surgical procedures. Therefore, don’t worry about your temporary swelling, and bruise during the healing process. Do not have massage and excessive facial animation immediately following fat grafting. These restrictions are to prevent migration of fat away from the desired areas of treatment. Keep your position educated and sleep with your head elevated 45 degrees for a few days to minimize swelling. Ice pack prevents your facial tissue from swelling and minimizes inflammation. Use ice pack for your surgical site for first 36-48 hours after surgery. Do as much time as you can. Apply ice pack gently around your surgical site for comfort and to reduce swelling and bruising. If necessary, surgeon put special tape on your surgical site for 3 days. Don’t remove the tape by yourself. If a surgeon does not apply any tape on your surgical site, you can wash your face and surgical site at the next day of surgery. If too plenty of fat is not injected, you can return to your workplace on the next day of surgery. Actually, there are some bruise and swelling after the surgery. However, there is no problem for you to get back to your daily living life because they can be camouflaged by make-up or cosmetics. It is very important that you must not rub surgical site and avoid excessive activity because grafted fat is well taken only if well vascularized environment is achieved. Usually, as fat survives with your own tissue during 3 weeks after the surgery, please do not have excessive movement or exercises. Rubbing surgical wound and excessive activity make the fat graft to be forced into an undesirable area or crumpled and succumbed to pressure and lack of blood supply. An additional follow-up appointment should be made for approximately 6-8 weeks. At this point, most of the edema has subsided, and early surgical results can be assessed. If a repeat procedure is to be performed, a waiting period of 3 months is prudent to allow the first graft to revascularize and to allow any edema to resolve. Don’t worry about the amount of fat injected by surgeon. Although placing too little fat obviously fails to correct the defect, increasing the amount of injected fat does not always prevent problems. Placing too much fat in a particular area can contribute to failure of revascularization of the graft. Graft necrosis may cause palpable irregularities and eventual disappearance of the grafted material. When grafting scarred areas, the graft tends to move to the areas of least tension. Clumping of the graft also may occur. This may be a particular problem under thin skin. After 1 month, if clumping is still a problem, the patient must be instructed on how to perform scar massage. Edema usually is evident for 2 weeks after the procedure; however, as with any procedure, prolonged edema is usually impossible and there are rarely cases troubling to the patient. Get plenty of rest for better survival of fat and follow balanced diet. Take pain medication as prescribed. Do not take aspirin or any products containing aspirin unless approved by your surgeon.